No matter what kind of physical shape you are in, each of us has areas of stubborn fat that simply doesn’t respond to exercise or dieting. Much of this is genetic, as some people simply hold more fat in areas than others. In addition, there are certain locations that just seem to collect fat no matter how we change our lifestyle. Liposuction is a common procedure Dr. Duboys performs to remove stubborn fat through a tiny cannula inserted through small incisions in the target areas. Recovery is not difficult and scarring is virtually non-existent. In the 30+ years since its debut, liposuction has come a long way. Today, liposuction with Dr. Duboys is a minimally invasive procedure with limited recovery. The incisions are tiny, usually not requiring stitches, and the bruising has vastly decreased. Plus, results are smoother and more contoured. What’s not to love about liposuction? If you have specific goals for your body shape that you have not been able to attain with diet and exercise alone, you may be interested in liposuction. This surgery is well-suited to men and women who are near their ideal weight, and who have positive expectations about what can be achieved with this fat-reducing-body contouring procedure. Liposuction is about sculpting the body, not about weight loss. Unless you have a body fat percentage of two percent, pretty much everyone has areas of fat here or there that they would like to get rid of. You are a good candidate for liposuction if you have such pockets of fat that don’t respond to dietary changes and exercise. The liposuction procedure first came to the U.S. in the 80s, after its development in France in the 1970s. Originally, lipo was quite a violent procedure. The cannulas used in those early days were relatively large and had to be moved about aggressively under the skin to break loose and suction out the fat cells. This caused extensive tissue trauma and bleeding, which led to bruising that could take months to fully clear. The procedure can achieve long-term results for individuals who are committed to healthy lifestyle habits. Although a certain number of fat cells are removed by liposuction, those that remain will expand under certain circumstances, such as a lack of physical activity or poor eating habits. Non-invasive procedures such as CoolSculpting, Vanquish, and Exilis reduce fat, but not to the degree that liposuction does. 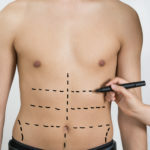 Liposuction can be combined with other procedures such as breast lifts and tummy tucks to increase their effectiveness. 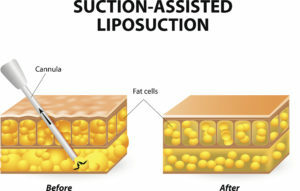 Liposuction targets fat pockets. A tummy tuck is best when you have loose skin that has been stretched by excessive weight gain or pregnancy. Often once a person loses the weight, the skin cannot return to its former degree of tautness. It can only be tightened with surgery to remove excess skin and tighten underlying muscles that have become separated — that’s the definition of a tummy tuck. Sometimes, liposuction can be added to a tummy tuck to remove pockets of fat, in the “love-handles” in addition to removing the excess skin. What Procedures Can Be Performed With Liposuction? Liposuction may be performed in conjunction with other contouring procedures, such as tummy tuck or breast lift surgery, which can address the numerous issues that stem from weight loss, motherhood, or age. Liposuction does not involve a painful recovery. After your procedure, treated areas will be wrapped to help reduce swelling, bruising, and pain. Compression garments or elastic bandages will then be worn over the treated areas for three to four weeks. This minimizes swelling and helps your skin and tissue adapt to their new contours. You will have a fair amount of bruising and swelling, however, for a week to 10 days. Depending on if you had one area or multiple areas treated, you can return to work in two to three days or it may be one week. As your swelling subsides, your full results will be evident, but this will take up to couple months for you to realize your final results. Liposuction removes fat cells and they usually don’t come back. However, if the patient gains a significant amount of weight, say 10% of his or her body weight, then new fat cells can develop. But if the patient doesn’t gain weight the new contour is permanent. Fat usually doesn’t return in the treated areas provided the patient doesn’t gain a significant amount of weight. Lesser weight gains will have fat that accumulates in untreated areas. In the first few days and weeks after liposuction, numbness, burning, bruising, and some bleeding may occur. Post-operative discomfort is typically minimal, and most patients are back to their normal routine within 1 week. However, it is important to expect swelling for up to 6 months after liposuction. As swelling progressively subsides, the final results from the procedure will be revealed. Associated Plastic Surgeons & Consultants is located in Huntington, Long Island. At our friendly practice, patients are provided with the extensive information they need to feel confident about their body contouring choices. We are here to help you look and feel your best. Call (631) 423-1000 to schedule your consultation.